Pictured are club and guest veterans, along with Program Coordinator Rosanne Apyan (front row) and Club President Todd Gaither (back row, far right). Captain McCamish is fourth from left on second row. The Rotary Club of Chattanooga Hamilton Place celebrated and honored veterans with a Veterans Day Program. Retired United States Navy Captain, Mickey McCamish joined the celebration as an honored Veteran and featured speaker. 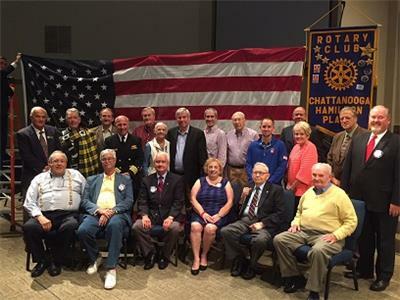 "The Rotary Club of Chattanooga Hamilton Place expressed sincere gratitude to our club and guest military veterans who have served our country, in addition to appreciating their families as they served in supporting roles of our military. Each branch of service, Navy, Coast Guard, Army, Marines and Air Force, and the Veteran associated with that branch, was recognized as their service branch song was played. Special recognition was paid to a WW II Veteran who attended our service," officials said.